Excellent artwork designed by Todd “Robbie” Robinson. 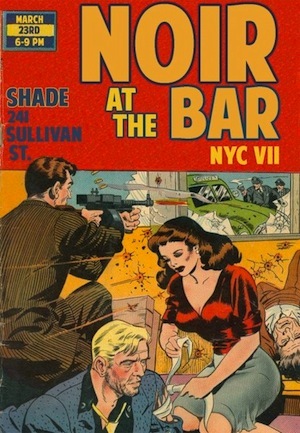 On Sunday, March 23, I’ll be reading at the next New York Noir @ the Bar with such top shelf writers as Dave “Snow” White, Hilary “Danger” Davidson, Jason “Super” Starr, Terrence “Two-Gun” McCauley, Glenn “Gregarious” Gray, Todd “The Tank” Robinson, Alex “The Silencer” Segura, and Tim “Oh Man, That Guy” O’Mara. The reading starts at 6 p.m. at Shade Bar, 241 Sullivan St., New York, at W. 3rd St. I’d love to see all my fans, both of you, there!